Infuse world-changing love into your community and the world. 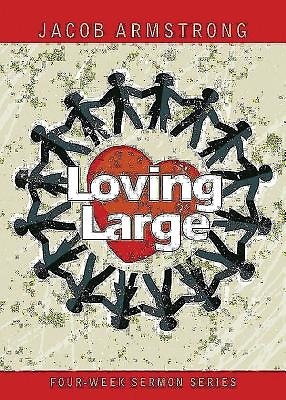 Loving Large is based on a four week sermon series that seeks to move people to action in their Christian faith. In a world that seems to run on money, greed, oil, power, etc., what would our world look like if it ran on the love of God? How can we infuse this world-changing love into our community and world? The series, developed by Jacob Armstrong, founding pastor of Providence UMC in Mt. Juliet, Tennessee, gives real opportunities for people to serve God and love their neighbor. It could possibly culminate with a church-wide day of service to the community. Week 1: The Distracted Life Week 2: Your Love Keeps Lifting Me Higher Week 3: Loving is Giving Week 4: Can We Really Change the World? The series includes a flash drive containing sermon outlines, a video trailer, professionally constructed PowerPoint graphics, promotional art, and a small group leader guide for discussion in Sunday school or house groups. The Loving Large devotional book brings the whole congregation together in reading and prayer daily. The weekly introductions and reading form content for small group study. In a world that seems to run on money, greed, oil, power, and more, what would our world look like if it ran on the love of God? How can we infuse this world-changing love into our community and world? This worship series is ideal for post-Easter or any time of the year. Loving Large gives real opportunities for people to serve God and love their neighbor and ends with an optional churchwide day of service. Jacob is one of the top young leaders in the U.S. Church. Amazing what the Spirit of God is doing through Jacob's work! Mike Slaughter, Ginghamsburg Church and author of Christmas is Not Your Birthday, shiny gods, and Change the World. Binding Type: Other - See "Special Finishing Instruction"